The Wrightstown Farmers Market - Times Publishing Newspapers, Inc. The market is held on the second and fourth Saturdays from 10:00am-noon, from December – April. Shoppers will find the same great vendors from the regular season market and some exciting new ones as well. “We are a producer-only market that seeks to connect customers and producers of locally, sustainably grown food products in a way that strengthens our community and local farming economy. We are very grateful to Anchor Church for generously providing us this welcoming space to do just that this winter,” said Cheryl Gilmore, the market manager. Both the winter and regular season markets host 25-31 vendors offering seasonal, organically and conventionally grown vegetables, herbs, flowers, grass fed beef, pasture raised poultry, pork and lamb, pastured and free-range eggs, yogurts and cheeses, artisanal breads and homemade baked goods. You will also find organic locally roasted coffee, raw local honey, kombucha, prepared foods, handmade soaps, dog treats, and much more. 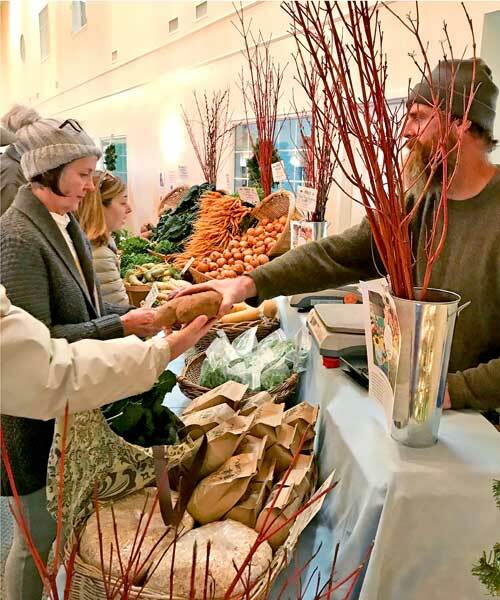 New vendors this winter season include: The Helpful Foodie (prepared, organic foods), Portch Tea (kombucha), Nutty Novelties, Sugar Maple Jerseys (cheese and beef products), and Noah’s Dove Farm (microgreens). This May will mark the start of the 14th regular market season, which is held every Saturday from 9:00am-1:00pm, rain or shine, from May-Thanksgiving. The coming season will see an increased number of chef demonstrations focusing on seasonal ingredients, which is part of an effort to offer customers more opportunities to learn how to incorporate local food into their lives. In addition, the regular season market hosts weekly musicians and kids’ activities.